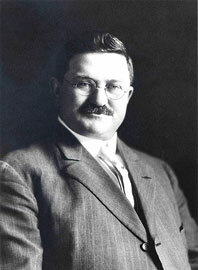 Architect Eben Ezra Roberts was originally from Boston, Massachusetts, where he attended public schools. His father, a woodcarver, trained him in both mechanical and freehand drawing. His formal education concluded with study at the Tilton Academy in New Hampshire. After moving to Chicago around 1889, Roberts worked for architect S. S. Beman in the Pullman neighborhood of Chicago until 1893. Like others in the craft, he learned a great deal on the job. In the year 1893, Roberts began his Oak Park practice. By 1912, Roberts had grown his business to become the largest architectural firm in Oak Park, and he decided to move operations to Chicago to focus on commercial building. In 1923, he formed a partnership with his son Elmer. In 1926, Roberts was forced into semi-retirement due to illness. As his career progressed, he designed houses in a rectilinear fashion, transforming the face of the Queen Anne. During his lifetime, E. E. Roberts designed buildings of many different styles, including Classic Revival, Medieval Revival, Shingle, Queen Anne, and Early Modern. As his style progressed, the curves, shapes, and decorative features of the Queen Anne began to straighten. His buildings took on a more rectilinear character. Certain Roberts structures embody characteristics of the Prairie School buildings designed at the time. Roberts did not directly copy what these other architects were doing. He evolved his own style, while still paying attention to local and international changes in architecture. The rectilinear character of these structures, which relate them to the Prairie School, began to evolve Roberts' work between 1895 to 1912.